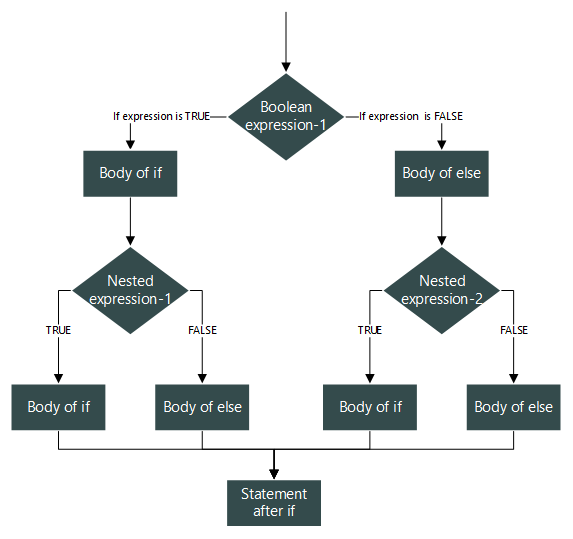 Simple if and if...else...if statements provide a great support to control programs flow. Simple if is single condition based task i.e. "if some condition is true, then do the task". In contrast if...else...if statement provides multiple condition checks i.e. "if some condition is true, then do some task. If the condition is false, then check some other condition and do some task. If all conditions fails, then do some default task." Consider a situation, where you want to execute a statement based on multiple levels of condition check. For example - At airport there are multi-levels of checking before boarding. First you go for basic security check, then ticket check. If you have valid ticket, then you go for passport check. If you have valid passport, then again you will go for security check. If all these steps are completed successfully, then only you can board otherwise actions are taken by the authority. Nested if...else statements has ability to control program flow based on multiple levels of condition. Note: In the above syntax I have nested one if...else statement inside another. However, any two decision statement can be inside other. Let us write a program to input three numbers from user. Find maximum between given three numbers. Let us now understand the working flow of above program. I think, you must be clear upto scanf() statement. Otherwise read in detail about basic input/output in C.
Suppose user inputs three numbers as num1=10, num2=20 and num3=30. The first outer if condition if(num1 > num2) is false since 10 > 20 is false. Hence, outer if statement is skipped, executing the outer else part. Inside the outer else, condition if(num2 > num3) is also false, since 20 > 30 is false. Hence, the inner if statement is skipped, executing inner else part. Inside the inner else there is nothing much to do. Just a simple printf() statement, printing "Num3 is max." Before moving to next tutorial, must try some exercises based on if...else statement. Practice exercise - if...else programming exercises in C.